Next to putting up my Christmas tree(s), creating a Christmas village is one of my favourite parts of holiday decorating. This year I thought I would give it a unique spin and incorporate it into my baking pan gallery wall. 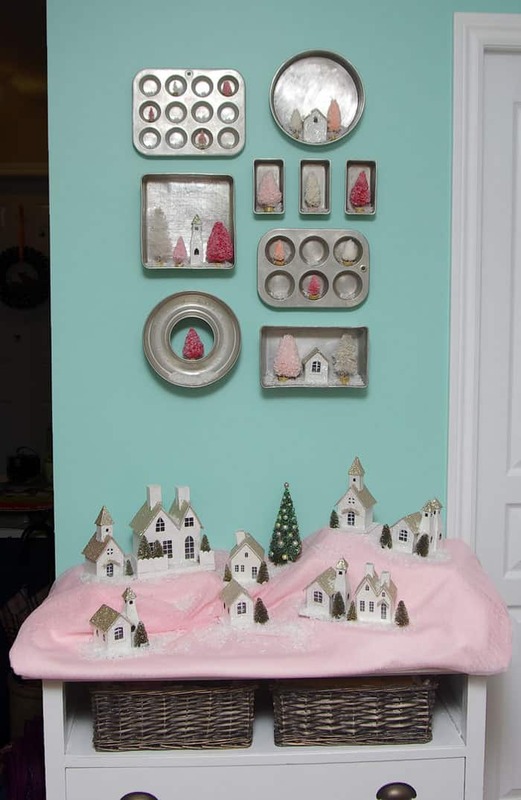 It turned out so cute it has been featured in a new holiday magazine MERRY MAG! 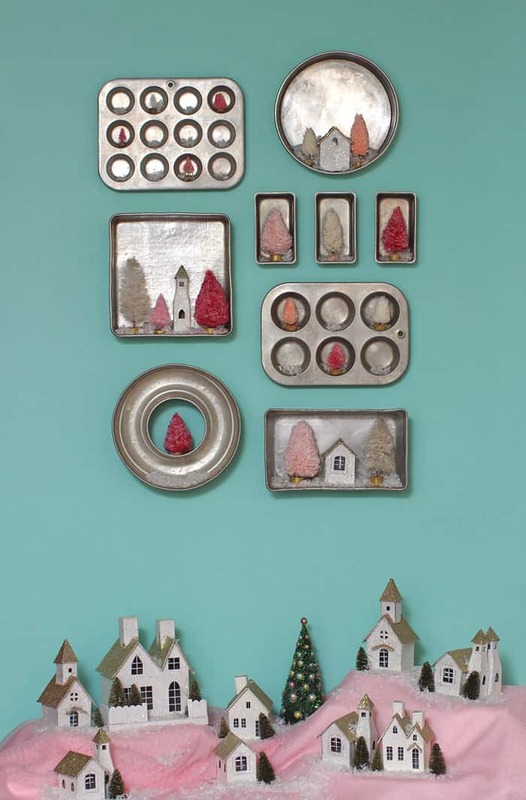 This Modern Christmas Village plus a few other of my favourite Christmas pieces are gracing the pages of this new online magazine. Be sure to click over to MERRY MAG to view 90+ pages of holiday inspiration. 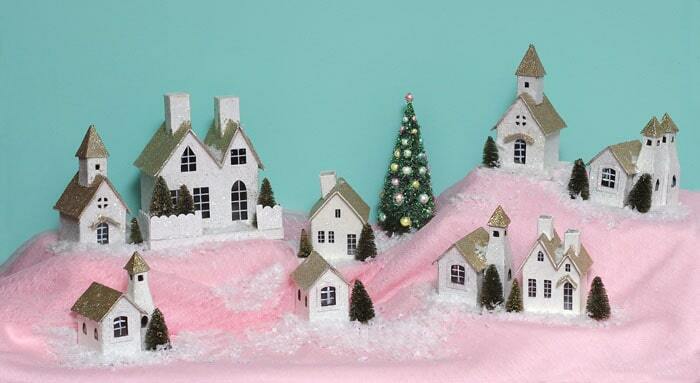 I couldn’t wait to share this exciting news about Merry Mag with you… plus my cute Vintage inspired Modern Christmas Village. I created the bottle brush trees from various colors of yarn by following this easy DIY bottle brush tree tutorial. I simply attached the cork tree base to the pans using strong double sided tape, and added a little dusting of snow. I love the shades of pink along side of the Whirlpool blue, it reminds me of candy! 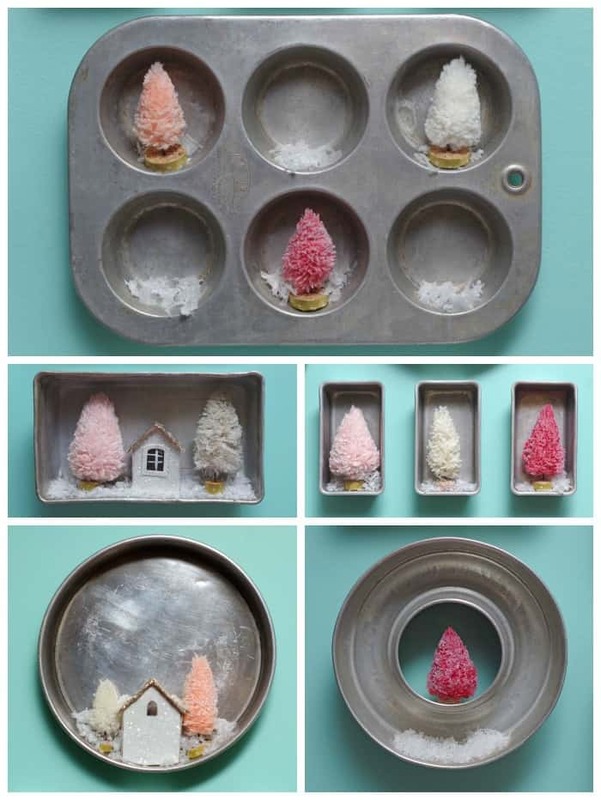 I love this little Christmas Village, easy set up … and easy take down! To make the small village houses fit into the baking pans I cut one in half with a craft knife, and adhered it with double sided tape. That is just a tiny sneak peek of what you’ll see in Merry Mag. Go grab your favourite Christmas drink, sit back and relax as you flip through the inspiration packed pages of this Holiday online magazine brought to you buy creator and editor Melissa from The Sweetest Escape. A big thanks to all the contributors, sponsors and especially Melissa who made this whole thing come together. I’m so pleased to have been asked to be a part of the premiere edition. Popping over from Merry Mondays! This is too cute! Makes me wish I had snagged my Grandmothers village when she passed. I love the vintage Christmas look. Thanks for sharing. I may need to visit that tree tutorial. THanks for visiting Sarah, Give the trees a try they are super easy! Thanks Claudine! I hope you can find some Christmas ideas to use in your own home! 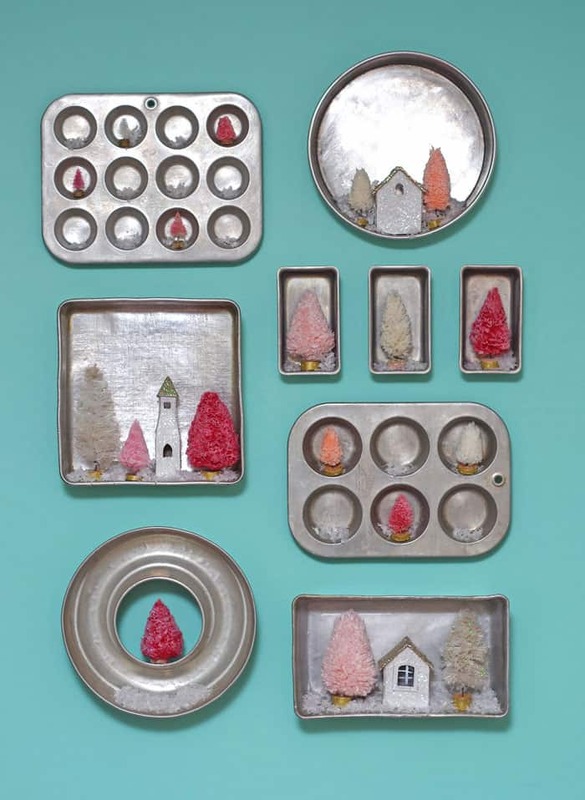 I like your use of vintage baking trays as display shelves. Very fitting for the season. I am a turquoise “junkie” and I just love the color of your wall! I know this post is old but how did you attach th pans to the wall? The presentation is gorgeous! THey were attached using command velcro, worked like a charm!